Originally published under the title "Terror the problem, not Islamophobia." Few North American Muslim advocacy groups have been willing to condemn violent jihad. One would have hoped that after the latest Islamic terror attack in America by the husband-wife team of Syed Rizwan Farook and Tashfeen Malik, U.S. Islamic organizations would recognize it was time to condemn "jihad" itself and to stop playing the victim card. However, that was too much to ask. Last year, in the face of growing ISIS-inspired jihadi terrorism, the Islamic Circle of North America (ICNA) along with other American Islamic organizations such as the Council on American-Islamic Relations (CAIR), formed the U.S. Council of Muslim Organizations (USCMO), which hosted a National Muslim Leadership Summit on Sunday in Washington, D.C.
ICNA is a conservative Islamic group formed in 1968 by Pakistani, Indian and Bangladeshi followers of the Jamaat-e-Islami in North America. Its stated goal is "to seek the pleasure of Allah " (for the) establishment of the Islamic system of life as spelled out in the Qur'an and the Sunnah (sayings) of Muhammad." ICNA and CAIR have shunned liberal Muslim groups that are critical of armed jihad and Shariah as a source of public law. ICNA states in its 2010 members' handbook, "Wherever the Islamic movement succeeds to establish true Islamic society, they will form coalition and alliances. This will lead to the unity of the Ummah (Muslim nation) and towards the establishment of the Khilafah (the Caliphate)." Predictably, ICNA and CAIR did not invite secular or liberal Muslim American groups who are critical of the doctrine of armed jihad and Islamic Shariah as a source of public law. CAIR may condemn the acts and means of radical violent Islamists, but no one should be fooled for a moment that CAIR's singular fixation (is) on stoking the flames and raising funds off the exaggerated narrative that Muslims are under siege by 'bigoted Americans' "¦ They are feeding the global movement against America. 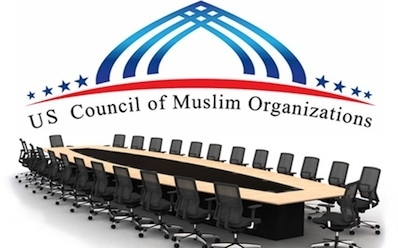 After the two-day USCMO session, the coalition promised "to combat all forms of violent extremism in the homeland," noting Muslims are the major victims of terrorist groups like ISIS and frequent victims of Islamophobia. But it did not renounce the doctrine of armed jihad that feeds Islamic terrorism nor call for taking politics out of American mosques. Instead, USCMO flexed its electoral muscle, deciding to conduct "a drive to register one million voters prior to the 2016 presidential election." There was no call to cleanse the American Muslim house of all jihadi literature. The problem is the Islamist victimhood agenda works well among guilt-ridden liberal Americans who are quick to buy into the propaganda of Islamophobia. Americans are getting duped by the agenda of Muslims who argue that a woman's honour lies in her 'chastity' and unwittingly pushing a platform to put a hijab on every woman. Please do this instead: Do not wear a headscarf in 'solidarity' with the ideology that most silences us, equating our bodies with 'honour.. Stand with us instead ... against the ideology of Islamism that demands we cover our hair. But is anyone listening to the voices of reason among North American Muslims?